for $32.00 which includes domestic shipping and handling. We are offering a free poster for a tax-deductible scholarship donation of $250.00 or more. 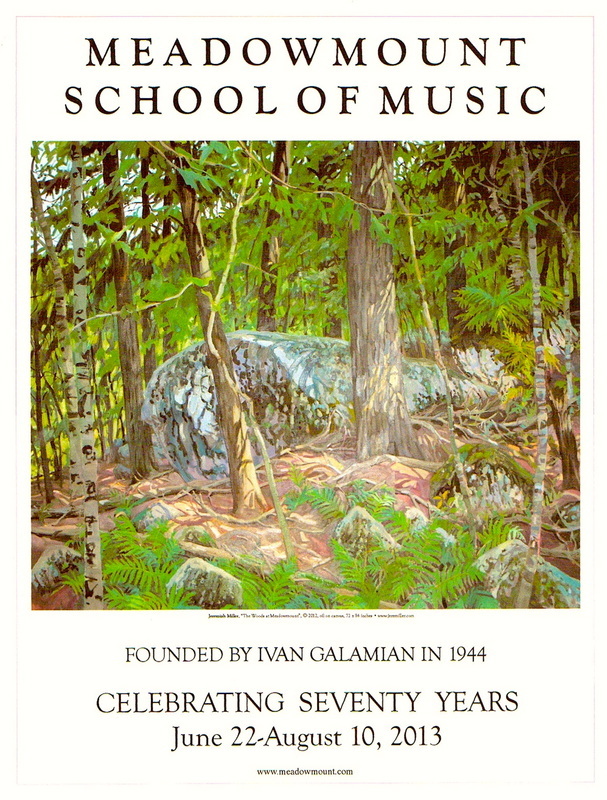 As important to me in celebrating Meadowmount’s 70 years of world class music making is taking the time to celebrate the extraordinary natural beauty that contributes so much to the Meadowmount Experience. Many of you have written about the Adirondack setting that meant so much to you and our guest artists regularly marvel at the beauty of the property. So, to help celebrate this side of Meadowmount I asked abstract-realist painter Jeremiah Miller to come up, look around and choose a scene to paint that he thought would represent Meadowmount at its best. The finished work is the overwhelming 72” x 84” painting you see on our 70th Season poster. Jeremiah has painted scenes from the mountains for most of his career but it was his connection to Meadowmount through his wife, violinist Sarah Johnson (Meadowmount: 1963-65, 1971-73) that led me to believe he was the one to engage for this commission. Enjoy! I arrived at Meadowmount on the last day of the 2012 session. A few remaining students and teachers were scurrying about saying goodbyes while staff was packing things away for the season. Director Eric Larsen gave me the golf-cart tour of the grounds as we discussed ideas for the painting. After setting up a temporary studio in Mr. Gingold’s Chamber Music Room, getting some directions and location suggestions from Mary McGowan, Administrative Director, and Ray Bazydlo, former Property Manager, I set out with my sketchbook and camera looking for the subject of my painting. My first impression of the school, as I assume it is for many, is the natural beauty of the surroundings. What a great place for musicians to concentrate on their work. The landscape offers one of the few distractions. I imagined a student, after hours of concentration and practice in one of those small studios, seeking a spot in the woods to sit and reflect on the days’ activities or to just allow their mind to wander from the self-imposed grind. That was the spot I wanted for the subject of my painting. I looked for a place that might be recognized; a location that would be close enough to the studios that one could have stumbled onto it without having walked too far into the woods. I chose a location up the hill behind the Main House near Garvey Cabin. I have taken some compositional liberties with the scene, but the large boulder at the center is distinct. An additional advantage of this location for me was its proximity to my makeshift studio in the Main House. Making sketches and modifications, I made frequent trips back and forth from the rocks in the woods to the large canvas in the house. During the time that it took to complete the painting, I pretty much had the place to myself, working all day and sometimes into the night. One of the things that I had to deal with was the constantly changing weather and light conditions. This offered a multitude of ideas for more paintings. My dilemma, because of the limited time frame to complete the work, was to settle on a direction and get the work done. (Too many ideas, not enough time). After nine days of work and the painting completed, I framed the work and left it to dry leaning on the bookshelves of the Gingold Library, loaded up my Subaru with paint, supplies and tools and headed back to North Carolina. I came away with sketches and ideas for more works and once I returned to my home I completed another large version of the same rocks. It was a great experience for me and I plan to return to the Adirondacks to do more paintings. I can understand why former students, in spite of all the hard work and somewhat austere conditions, speak so fondly of their time at the School. I want to thank Mary and Ray who went out of their way to offer help and hospitality during my stay and especially Mr. Larsen for giving me the opportunity to contribute to Meadowmount’s 70th Celebration.